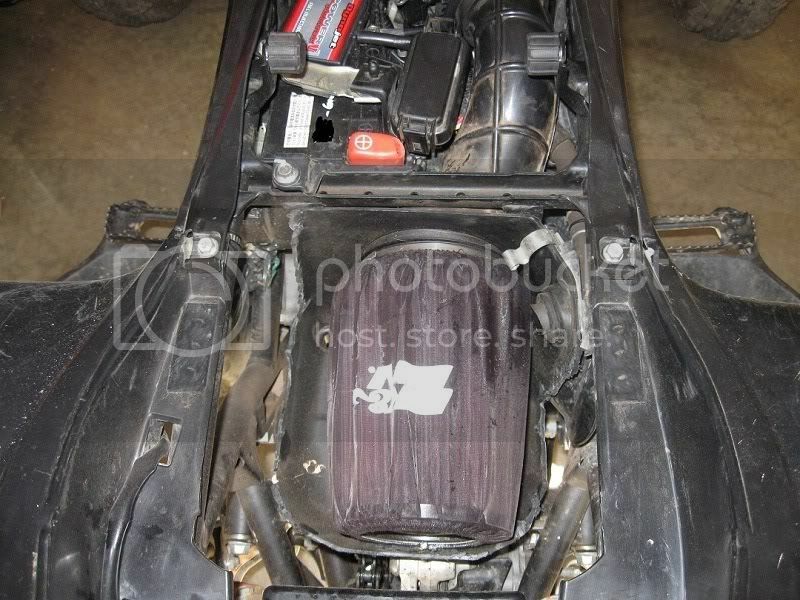 Club700XX - Honda TRX700XX Forum > TRX700XX Technical Forums > Motor, Transmission, Electrical, Intake & Exhaust > Best air intake set up? Best air intake set up? Whats going on, I just put a DMC full exhaust and efi on my bike and now Im looking for a intake set up. There are so many out there claiming to be the best that I dont know which way to go. I know K&N been around for ever but I feel they are very over rated. I like the velocity center air filter but I'd rather hear what people have and what they think. Any info will help. Most guys here like the uni, and a lot are running ehs lids. The lids have outerwears on them. I have also read that k&n doesn't filter well but the lid has a prefilter so the air filter is already filtering cleaner air. They also say the uni filters cage is less resrictive than the factory cage. I cut the top off of my lid and put a pre-filter over the whole thing and removed the baffle, i'm using uni filters for both, seems to really breathe. Anybody have the velocity filter? How does it breath? The combination Im looking at is the velocity filter with the ehs lid. A lot of people like the Uni filters is that do to cost or5 performance or both? I have the modquad intake with a k&n filter and the ehs lid. The k&n also has an outerwears wrap around it. I think it works pretty well. I have UNI and EHS lid with optional side vents. First Ive heard of this! I have a K&N..... It seems fine. I run a K&N with no air box and it filters great.